Get to know what your business is worth. We’ll step through the Balance Sheet from the Sample Financial Statements from top to bottom, just as we did with the others. It will be helpful to have the sample balance sheet (toggle below) in front of you when reviewing this information. Review the definitions and examples in this section and use them together as a template for creating your business plan financials. By familiarizing yourself with these core concepts, you’ll be ready to speak the language of investors and lenders. Assets. 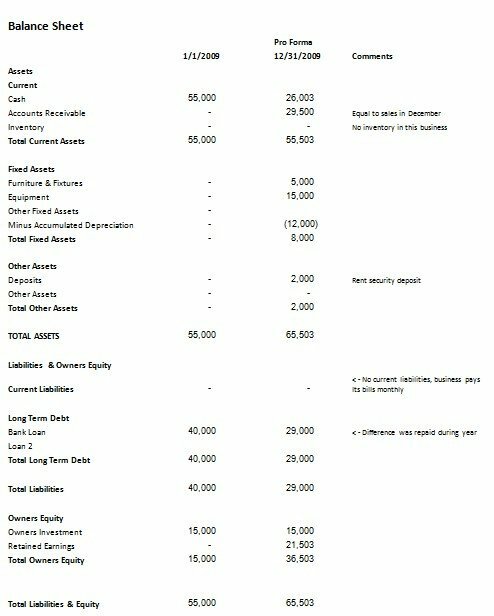 The Balance Sheet categorizes Assets into “Current” and “Long Term.” Each is described below. Current Assets. A Current Asset is something that is already cash, or is expected to be turned into cash within one year. In our sample financial statements, Current Assets include Cash, Accounts Receivable and Inventory. Fixed Assets. Fixed Assets can be thought of as long-term assets. They are owned, but not expected to turn into cash within the next year. On the sample financials, we include Furniture & Fixtures and Equipment as Fixed Assets. These assets are listed at their purchase price, even if they have been owned for several years. To adjust the value, the Accumulated Depreciation is listed (as a negative number) with the Fixed Assets. This is the total amount of Depreciation Expense taken against the asset’s value since the asset was owned. Other Assets. Assets that do not fit neatly into Current or Fixed Assets, can be listed under Other Assets. An example is the rent deposit from our Sample Financial Statements. Since we don’t expect the deposit to turn into cash in the next year, it’s not a Current Asset. Similarly, it’s not a Fixed Asset that gets depreciated over time. So, we list it under Other Assets. Total Assets. Total Assets equal the sum of the Current Assets, Fixed Assets (adjusted for depreciation) and Other Assets. This is, in effect, the value of what the business owns. Liabilities. Just as assets are categorized into Current and Fixed, Liabilities are classified into Current Liabilities and Long-Term Debt. Current Liabilities. A Current Liability is one that is expected to be repaid within a year. The amount owned on a credit card bill, or loans due within one year should be listed as Current Liabilities. Notice on our Sample Financial Statements, Current Liabilities are listed as $0. As a startup business, the company has little or no credit with vendors and pays its bills in full each month. The loan the company has is not due within a year and therefore is not a Current Liability. So, it is accurate in this case to say that the Current Liabilities are $0. Long-Term Debt. Long-Term Debt is any loan which is extended for a period of one year or more. In our Sample Balance Sheet, notice that at the beginning of the year, the Bank Loan was listed as $40,000. As of Dec. 31, the loan was listed as $29,000. The difference is the $11,000 of principal repayment that took place during the year. Total Liabilities. Total Liabilities are the sum of the Current Liabilities and Long-Term Debt. Owners Equity. Owners equity comes in two forms—that which the owner invested in the company, and the cumulative total earnings that the company has left in the business. Each is addressed below. Owners Investment (or Owners Capital Account). This is the amount of cash that the owner has invested in the company. The cash itself would show up as a Current Asset, but the corresponding entry is not treated as a liability as a bank loan would be. Rather, it goes in the Owners Capital Account. In the grand scheme of things, if the business were unable to repay its obligations, the Owner’s Investment ranks below Liabilities. While the owner could make a loan to the company, which would be a liability, many times bankers or other investors want to see a founder have “skin in the game” by investing their own money as capital, not a loan. This tells them the owner is putting money in and leaving it in. Retained Earnings. The amount of Retained Earnings is the cumulative Net Operating Income since the inception of the business. Our Sample Balance sheet shows at the end of the year Retained Earnings of $21,503, the same as the Net Operating Income. If the business earned the same amount next year and the funds were not paid out as taxes or dividends (or otherwise distributed), the Retained Earnings would be $43,006, or double the first year’s amount. Conversely, if the business actually lost money in the first year (which is not unusual), the company could have negative Retained Earnings. Our Pro-Forma Sample Financial Statements don’t show any adjustments to Net Operating Income, as might be found in the historical statements of an actual company. These adjustments might include taxes or dividends paid to the shareholders. 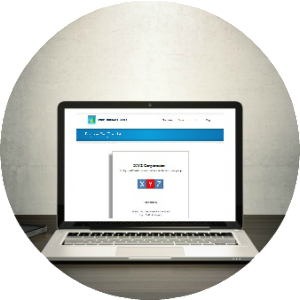 The company behind our Sample Financials is a “Sub-S” Corporation, and the tax responsibility flows through to the owners individually. As for dividends, it would be unusual for a startup company to forecast dividends—and it would not be something a lender or investor would want to see. They would want to see excess cash left in the business for contingency needs, or to accelerate growth. Naturally, if the company accumulated a significant amount of earnings, there would be a discussion about what to do with the earnings. For now, though, nobody will be concerned that you might end up with too much cash. Total Owners Equity. The Total Owners Equity is the sum of the Owners Capital and Retained Earnings. You can see in the Sample Financial Statements that our owner invested $15,000 and at the end of the year had Owners Equity of $36,503. The primary driver of the change was the Net Operating Income, or profitability of the business. Total Liabilities and Equity. Since a Balance Sheet has to balance, Total Liabilities are added to Total Owners Equity and called just that, Total Liabilities and Equity. This amount should equal or balance with Total Assets. Recall the Balance Sheet Formula: Total Assets = Total Liabilities + Owners Equity.